Flores Island belongs to Indonesia, the biggest archipelago on earth that consists of more than 17.000 islands between Asia and Australia. 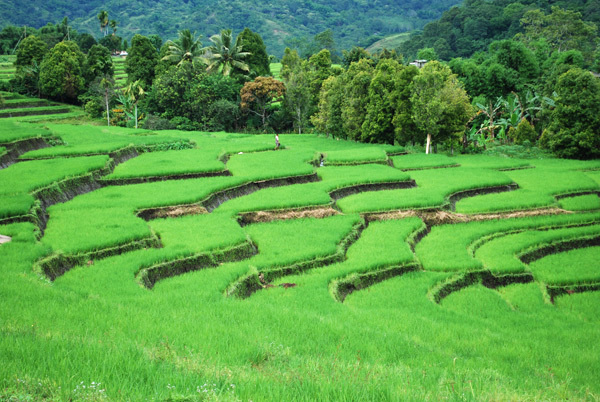 Flores is located to the east of Bali and belongs to the Small - Sunda - Islands. 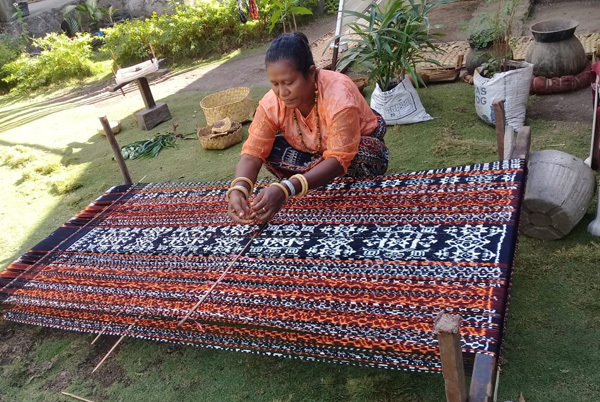 In company with the island Sumba, the western part of the island Timor and a few smaller islands - Alor, Sabu Rote, Solor and Lembata - Flores belongs to the province Nusa Tenggara whose capital Kupang is on West Timor. The island Flores is subdivided into six areas that are called - from the West to the East - Manggarai, Ngada, Ende-Lio, Sikka, Flores Timor and Lembata with their capitals Ruteng, Bajawa, Ende, Maumere, Larantuka and Lewoleba. Characteristic of the island is the remarkable difference in altitude between the mountainous regions (with summits that are between 2100 and 2445 metres high) and the depth of the sea that is partially 5000 metres. Flores has 14 active volcanos and there were some volcanic eruptions in the recent past : Mount Lewotobi (Eastern Flores) in 1938, Mt. Lerek (Lembata) in 1948, Mt. Rokatenda (Palue) in 1964 and Mt. Ia (Ende) in 1969. The strongest earthquake for hundred years has been on December 12th 1992. The most famose volcano is Volcano Kelimutu and his tree coloured lakes. On Flores there is the typical monsoon climate. The northwest monsoon (December till March) with wind from the West to the Northwest brings rain. During the southeast monsoon (May till October) there is dry season with wind from the West to the South-East. In the months between the two monsoons there is wind coming from all directions. Regarding the frequency of the rainfall, Flores can be subdivided into three areas: 1. the dry north coast with less than 1.000 mm rain per annum, 2. the central mountains with more than 2.000 mm rain p.a. and 3. the south coast that profits by the rainfall more often. The northeastern regions of Flores - thereto also belong the Maumere region - have the least rainfall frequency on the whole island and oftentimes there is no rainy season. As many other things in life, this fact has two points of view: on the one hand it is an invitation for all the sun-hungry tourists who also want to enjoy a beach holiday in Waiara/Maumere during the rainy season, but on the other hand the absence of the rainy season results in famines for the population. The so-called Wallace line passes between the islands of Indonesia. It separates the island of Bali located east of Java, and the further north, Borneo by the further east of the islands of Lombok and Celebes. This split is so named after the English naturalist Alfred Russel Wallace, who stated during his travels between 1854 and 1862, that certain Asian mammals such as elephants, Tigers, tapirs, and orang utan occur on Sumatra, Java and Bali but not on Sulawesi, the Moluccas and the small Sunda Islands. The differences in the animal world, East and West of the Wallace line date back to the ice age. While the islands of Java and Bali periodically were connected during the Pleistocene to the Asian mainland, the islands east of the Wallace line were long geographically isolated and only to reach by the sea. Flores lies east of the Wallace line and you can not find here large Asian mammals but many Asian birds, insects and you can find reptiles. The most famous reptile is the Komodo dragon, the largest living lizard . Although this lizard with a length of 3 m and a weight of up to 150 kg is not inconspicuous, this type was as recently as 1912 disclosed by the Dutchman OUWENS to the science. The Komodo dragons live on Komodo Islands (here they have been discovered, hence the name) as well as on Rinca Island. This Islands are located West of Flores Island and the port of entrance is Labuan Bajo. From Labuan Bajo it is 2 hours boat sail to Rinca Island and 4 hours boat sail to Komodo Island. But most important is the very rich marine life, coral reefs as well as fish species. Mr. Rudie Kuiter in a two-week survey in 1987 listed 850 species in 82 families, and he expected to discover still many new species, which are new to science. Indications are that it may be one of the richest coral reefs in the world. Even the flowery name "Capo of the Flowers" suggests it, not more flowers grow here than in other parts of Indonesia. However, the landscape of Flores is very green. Most of the original monsoon forests are today agricultural land. But still if you travel during or close after the rainy season you may think driving through a jungle. This are "gardens" which are jointly managed by the village communities. Many tropical crops, such as coffee, cocoa, bananas, durian, jackfruit, papaya, vanilla, and more grow across messed up and only the community know to differentiate who owns whichever tree or branch. In the East of the island long time predominated Alang-Alang grass the landscape but now also these areas are successfully converted into agricultural land. The hillsides are terraced to ensure adequate nutrition of the population. East Nusa Tenggara is in many ways unlike the rest of Indonesia. It is geographically, ethnically, and culturally a border separating Asia from Australia and Micronesia. The Malay and Melanesian culture origin of the population cannot be overlooked. There are also descendants of the Portuguese and the small islands in the Flores Sea and also in the villages on the North coast of Flores are populated by Bajau, Bugis, and Butones, originally from Sulawesi. In addition to the ten languages, spoken by six ethnic groups, there are still many dialects. The Indonesian language "Bahasa Indonesia" is official language and in schools. 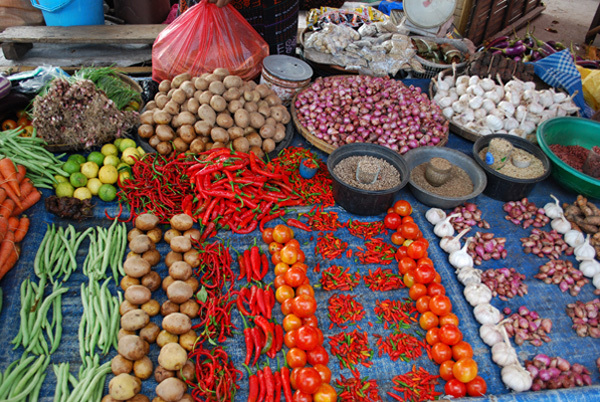 Flores cuts into six areas and each one has its own language. 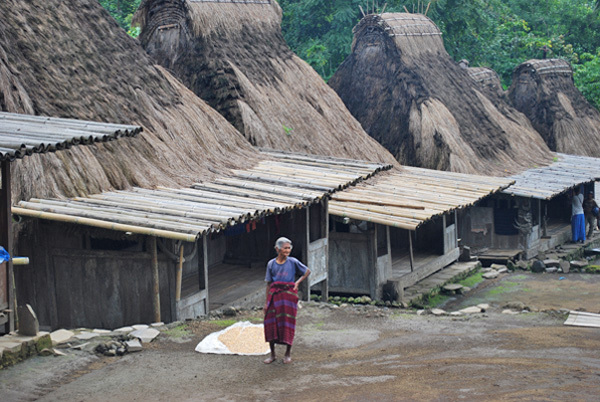 254.000 of the 2.000.000 inhabitants of Flores live in Sikka. More than 20.000 people live in Maumere. More than three quarters of the population confess to the Roman Catholic Church. The rest, predominantly in the western regions of the island and in the seaports, are adherents of the Islam.